Going to start collecting aluminum now. It’s always nice to have confirmation that “every little bit helps.” Cool post! We definitely don’t drink that much soda, but we do accumulate wine bottles and other recyclables. I find it more valuable to let them accumulate for awhile before going to the depot. That way, the time taken to drive to the depot is more worth it. Here in Canada We have an awesome Recycling system, that pays a lot, but we do pay for it at the till. It’s a great way to get your money back. In Canada ours include Milk Jugs, Juice containers, including lunch box juice boxs. Those are some great ideas. Another one people don’t think of too often is cardboard. You need a lot of it to resell it as a commodity, but it can be done. There are a ton of businesses that would rather give away their cardboard than pay for it to be recycled or trashed. Selling recycled material is a great fundraiser for kids. In our small community a lot of the high school kids collect bottles, etc. and then use them towards their grad or prom. I used to walk many miles collecting cans when I was younger. I would look in parks after events, in trash cans and dumpsters and even walk along the railroad lines. I could often find a few dollars worth of cans with little effort and that would get me a soda and some credits on my favorite video games. I am not so sure that many kids are willing to do the dumpster diving dirty work to look for cans these days. Those are the product specifications. Another one individuals do not think of too often is card board. You need a lot of it to sell it as a product, but it can be done. There are a ton of companies that would rather hand out their card board than pay for it to be reprocessed or removed. Thanks. Very frustrating that there are NO DIRECTIONS for making the soda can bracelets. I saw the directions at one time, however, they are not there now. PLEASE ADVISE! 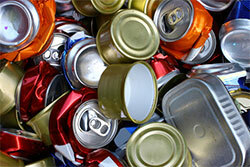 Aluminum prices are definitely down, but still worth stockpiling if you have the room. Copper is still relatively profitable, albeit down at the moment too.